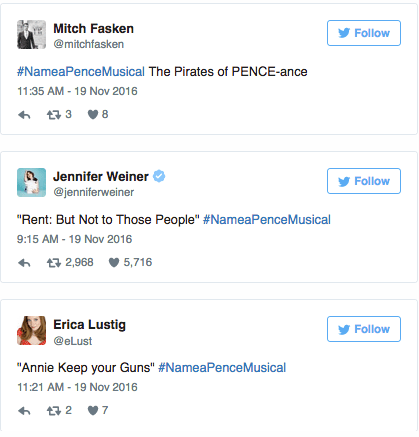 After the cast of “Hamilton” called on Vice president-elect Mike Pence to help lead an inclusive administration Friday, the Twitterverse soon weighed in, with hashtags #NameAPenceMusical and #BoycottHamilton quickly trending. This Twitter user swapped out the word “Miserables” for “deplorables,” Hillary Clinton’s infamous description of some of Trump’s followers, who later co-opted the term during the election. Other users took to Twitter to express their displeasure with the exchange and called to boycott the show. But it wasn’t long before fans of the show realized that if that were to happen, maybe tickets would be easier to snag. “You know what? I support #BoycottHamilton. I hope it intensifies — especially during the first week of March, maybe that Sunday matinee?” comedian Patton Oswalt tweeted. “For everyone who is going to #BoycottHamilton my family, friends, & I will fall on the sword & take your tickets. #wegotyou,” fitness guru Jillian Michaels posted. President-elect Donald Trump condemned the statement Saturday morning, saying the cast “harassed” the VP-elect. Why did Trump think this statement was bad? Keep showing your asses white folks, your hatred will come back to bite you. Good always overcomes Evil, you will fail.